Space shuttle Discovery lifts off, Feb. 24, 2011. See images of the historic final launch of Discovery. This story was updated at 8:59 p.m. ET. CAPE CANAVERAL, Fla. – In a spectacular and at times nail-biting afternoon launch, the space shuttle Discovery blasted off on one final mission today (Feb. 24) to cap off its prolific 27 years of spaceflight. The launch came as a relief after a last-minute glitch arose in a range-safety computer, threatening to prevent the liftoff. NASA cannot launch a shuttle unless the air space over Cape Canaveral is cleared by range safety officials. The issue was resolved within minutes of the launch, allowing Discovery to fly after all. "It was kind of an exciting last few minutes of this countdown. Several of us have been around for many, many countdowns, and this was one for the record books," said Mike Leinbach, NASA's shuttle launch director. "We were a couple seconds away from losing the window." 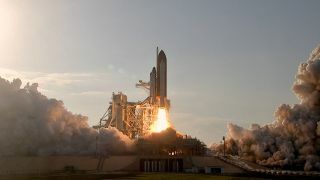 "For those watching, get ready to witness the majesty and the power of the shuttle Discovery as she lifts off one more time," the mission's commander Steve Lindsey said from the crew cabin minutes before launch. NASA estimated that record crowds watched the orbiter's last liftoff from Florida's Space Coast. Some reports put the number of onlookers at 40,000. The successful launch marks the beginning of Discovery's STS-133 mission – its 39th and final flight to the International Space Station before it is retired from service. The liftoff came after months of delay over problems with the shuttle's fuel tank. NASA also had to tackle an emergency repair today to fix a nicked heat shield tile near Discovery's crew hatch. But everything ended up going off without a hitch. "This is a pretty tremendous day in spaceflight for us," said Bill Gerstenmaier, NASA's space operations chief. A few minutes into the launch, a piece of foam appeared to detach from the shuttle's external tank. Gersteinmaier said that cursory analysis showed that there was some foam loss during ascent, but that it occurred well after the time when such an event could seriously damage the shuttle. "They're all after the aerodynamic sensitive times, so they're not a concern to us," Gerstenmaier said. "There's one that's pretty noticeable around 3 minutes and 51 seconds - it's probably a piece of foam about 8 by 10 inches that comes off, but that's well after the area of concern from an impact-to-the-orbiter standpoint." The shuttle's 11-day mission will deliver important supplies and critical hardware to the space station, including a much-needed storage module that will be attached to the Earth-facing side of the American Unity node. Discovery is also carrying what will become the space station's first permanent robotic resident — the humanoid Robonaut 2. Discovery will dock at the space station on Saturday (Feb. 26). "STS-133 crew and Discovery, welcome to space! We just doubled the number of extraterrestrial humans!" wrote Italian astronaut Paolo Nespoli on Twitter, from his perch on the International Space Station. Nespoli is one of six long-term crewmembers living at the orbital outpost right now. The space shuttle Discovery's final crew, the six astronauts of NASA's STS-133 mission, head to Launch Pad 39A at the Kennedy Space Center in Florida for launch on Feb. 24, 2011. Discovery is NASA's oldest and most-flown space shuttle. It was first launched in August 1984, and has since traveled more than 142 million miles and carried 246 crewmembers into space, NASA officials said. The veteran shuttle's last crew is made up of commander Steve Lindsey, pilot Eric Boe, and mission specialists Michael Barratt, Alvin Drew, Steve Bowen and Nicole Stott. "Thanks for all your kind words for me & the whole STS133 crew. Will try to tweet from space. Go Discovery!" Stott wrote on Twitter prior to launch. Mission specialist Bowen was a last-minute substitute for astronaut Tim Kopra, who was injured in a bicycle accident in January. In addition to the standard duties as a mission specialist, Bowen will also take Kopra's place on two planned spacewalks to perform routine station maintenance. Discovery's launch this afternoon came on what was a busy day for the International Space Station. Less than six hours before Discovery lifted off, an unmanned European cargo ship, the Johannes Kepler Automated Transfer Vehicle 2 (ATV-2), arrived and docked to the orbiting outpost. During Discovery's mission, NASA and the space station's international partners will decide whether to stage a unique photo opportunity. NASA officials discussed having the Russian Soyuz capsule undock from the station and fly around it to snap a photograph of Discovery and the other spacecraft docked to the completed laboratory. Much remains to be done over the next week and a half, but the Discovery team will savor today's success — at least for a little while. "This was Discovery's last, great way to go out," Leinbach said. "She gave us a little bit of a fit today, but it's a great way to get Steve Lindsey and his crew on orbit. I'm very, very proud of my launch team and all the rest of the people that work so hard on Discovery and the support systems around the country." You can follow SPACE.com staff writer Denise Chow onTwitter @denisechow as she covers Discovery's final space voyage from Cape Canaveral, Fla. Visit SPACE.com for complete coverage of Discovery's final mission STS-133.